We offer three models in 48, 24 and 12 volt output with 10 amp power rating, all of which are single DIN rail mount units providing power and alarm functions. 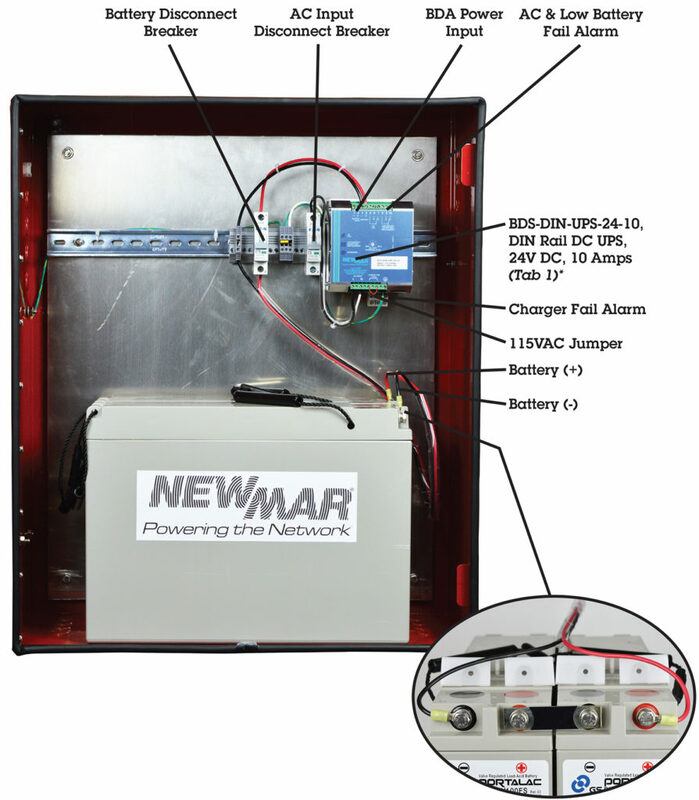 Other solutions require supplementary components to achieve the full range of features that are built-in Newmar’s DIN rail DC UPS series: a power supply, a charging circuit to maintain the NFPA required 12 hour back-up battery, a low voltage disconnect (LVD) which takes the battery offline when it’s depleted to prevent damage, and a full range of alarm functions required under NFPA rules. Among the built-in NFPA required alarms is an AC power failure signal. In the event of AC fail, a signal is generated to the control panel indicating AC is no longer present and the system is running on reserve battery. The DC UPS is also programmed to provide alarm notification when AC is present but internal battery charger fails to operate. This is critical because if the charger fails, the backup battery will drain, leaving it unable to power the system should an emergency occur. A third alarm provides vital power availability information to onsite emergency personnel who must stay in contact with each other and scene commanders. 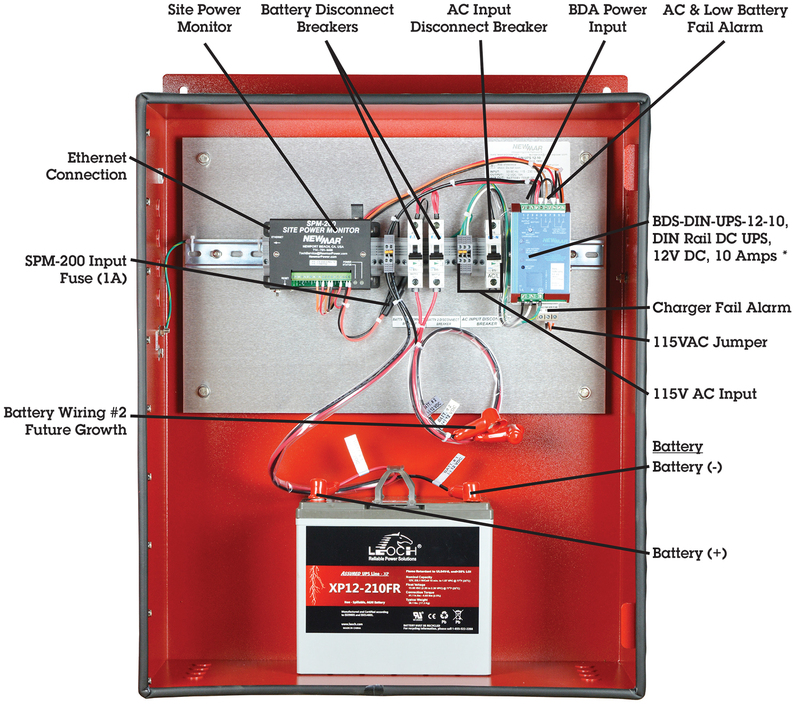 To meet NFPA rules, our DIN Rail DC UPS includes a back-up battery discharge signal that will activate when the reserve battery reaches 30% remaining capacity. This notifies first responders they have limited remaining in-building communications capability and will also, alert network administrators if the backup battery is depleting faster than expected when in use. A reliable network can do more than provide connectivity in public spaces for employees and guests. A well designed public safety DAS network can protect your building and provide the peace of mind that comes with preparation. 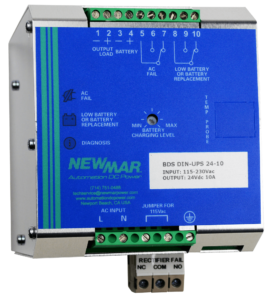 Newmar’s DIN rail mounted DC UPS BDS series combines ease of installation and streamlined functionality with a full array of features to ensure your network meets requirements and will be ready to perform in any emergency. 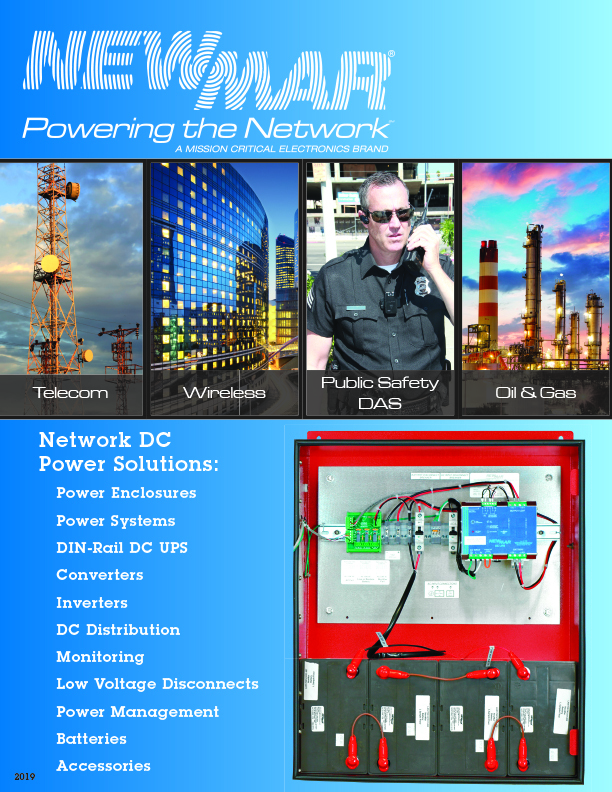 Click here for more information on DIN Rail DC Power for BDA/BDA that meets NFPA 1221 requirements. 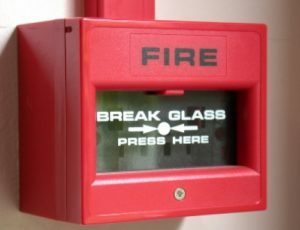 Back-up power is the critical element in the reliability of NFPA 1221 in-building emergency response radio coverage applications. Configuring a system that will survive in the intended application requires close attention to detail. Large systems/central office applications typically utilize well engineered/integrated DC systems with a goal of providing five 9’s reliability (99.999%). Public Safety DAS Power mounted enclosures are in similar need of high reliability but lack the space and budgets of Tier 1 systems. However, with good engineering practices and component selection, high reliability and economical DC power can be achieved in these smaller, often hostile environment applications. 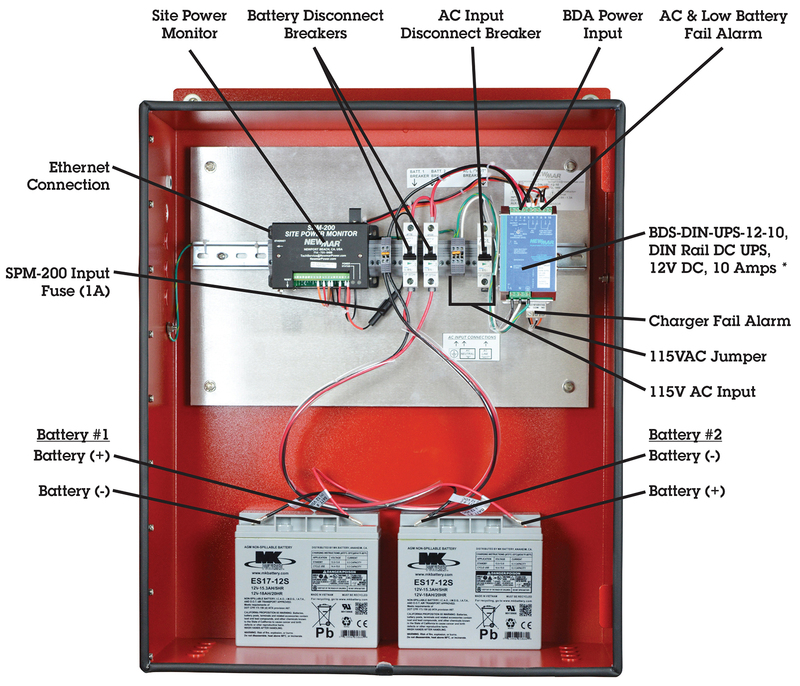 There are critical issues which much be considered in configuring an enclosure power system. Number one is temperature which is a known killer of power electronic circuits and the batteries they maintain under constant charge. Watertight enclosures provide little or no ventilation thus components must be rated for high temperature, and operate without fans as they provide no benefit. Properly designed DC UPS are a good choice for these applications as they typically operate to 70˚ C and rely only on convection cooling, having no moving parts, and utilize high efficiency circuitry minimizing heat generation. 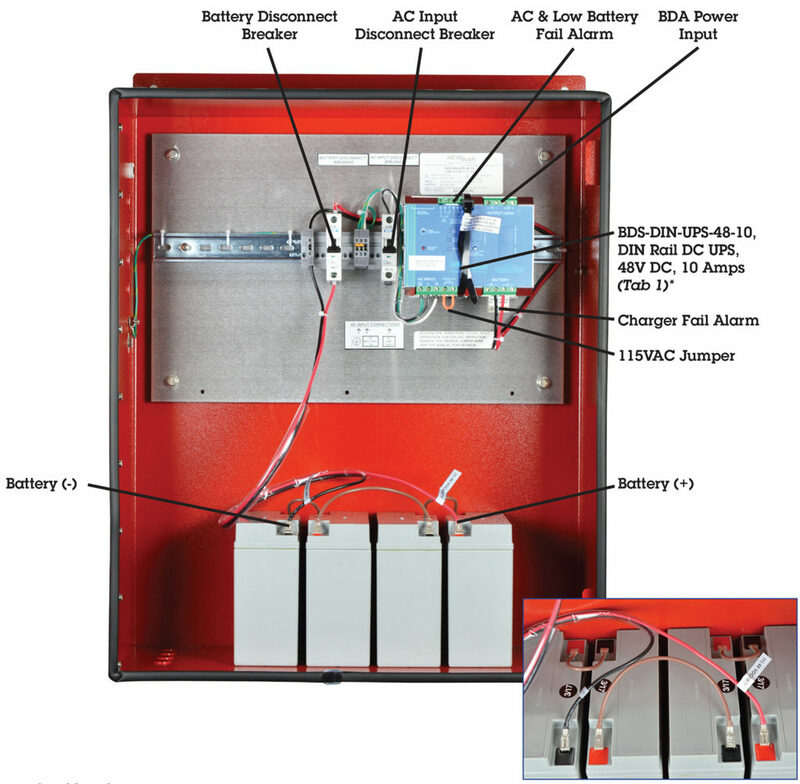 Batteries are the heart of the system and must be charged at the proper voltage under varying seasonal temperatures. A good DC UPS offers temperature compensated output, reducing voltage in high temperatures to avoid overcharge , and increasing voltage to batteries in low temperatures to prevent undercharge. 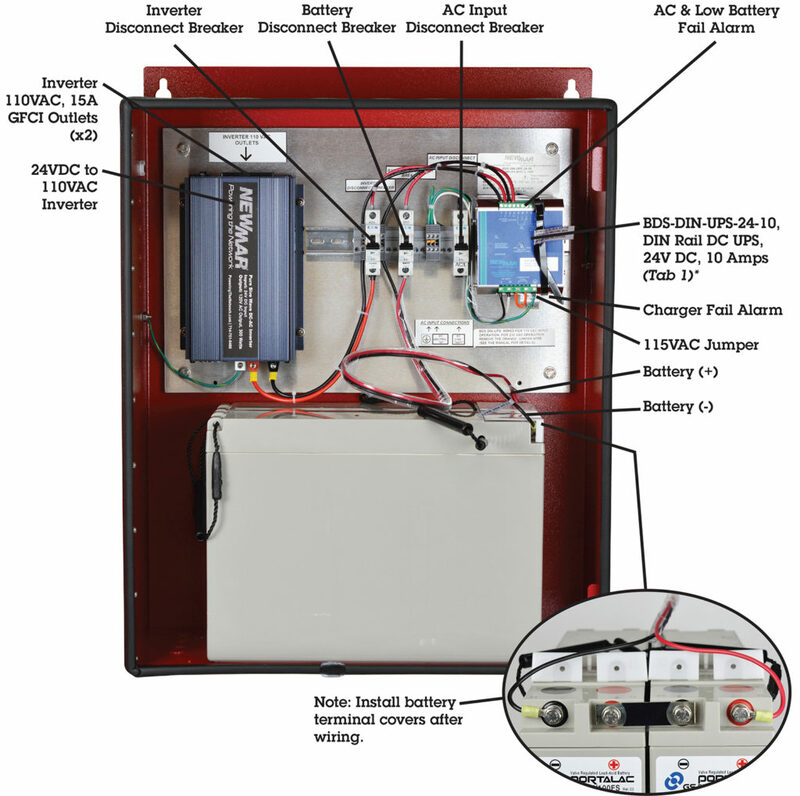 In addition the DC UPS should be programmable for use with various types of battery chemistry: lead, AGM, Gel, Ni-cad, etc. NFPA 1221 status monitoring requirements add to reliability in performance as problems can often be detected before total shut down occurs. Among the built-in NFPA required alarms is an AC power failure signal. In the event of AC fail, a signal is generated to the control panel indicating AC is no longer present and the system is running on reserve battery. The DC UPS is also programmed to provide alarm notification when AC is present but internal battery charger fails to operate. This is critical because if the charger fails, the backup battery will drain, leaving it unable to power the system should an emergency occur. A third alarm provides vital power availability information to onsite emergency personnel who must stay in contact with each other and scene commanders. 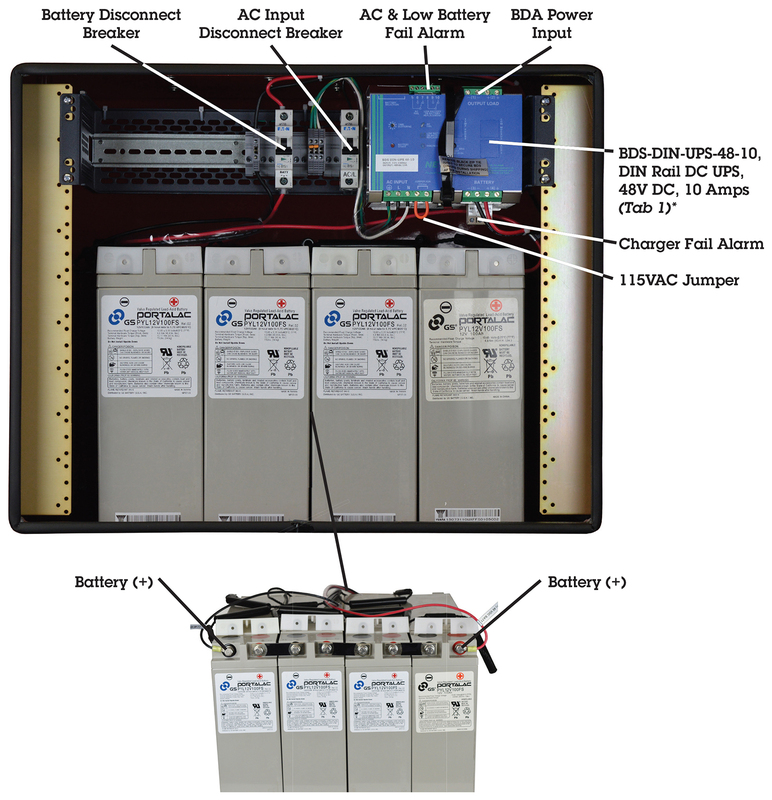 To meet NFPA rules, our DIN Rail DC UPS includes a back-up battery discharge signal that will activate when the reserve battery reaches 30% remaining capacity. This notifies first responders they have limited remaining in-building communications capability and will also, alert network administrators if the backup battery is depleting faster than expected when in use. DIN rail mounting method is ideal for securing components in enclosures where devices quickly and securely click on to the rail and have front terminals which provide easy access for AC input, load and battery wiring. Integrators are best served by utilizing DC systems that are designed for enclosure applications rather than trying to cobble together an interconnected assembly of various components and then going through the often painful proving out process. NFPA codes relating to the autonomous operation and monitoring of the BDA power is quite stringent. 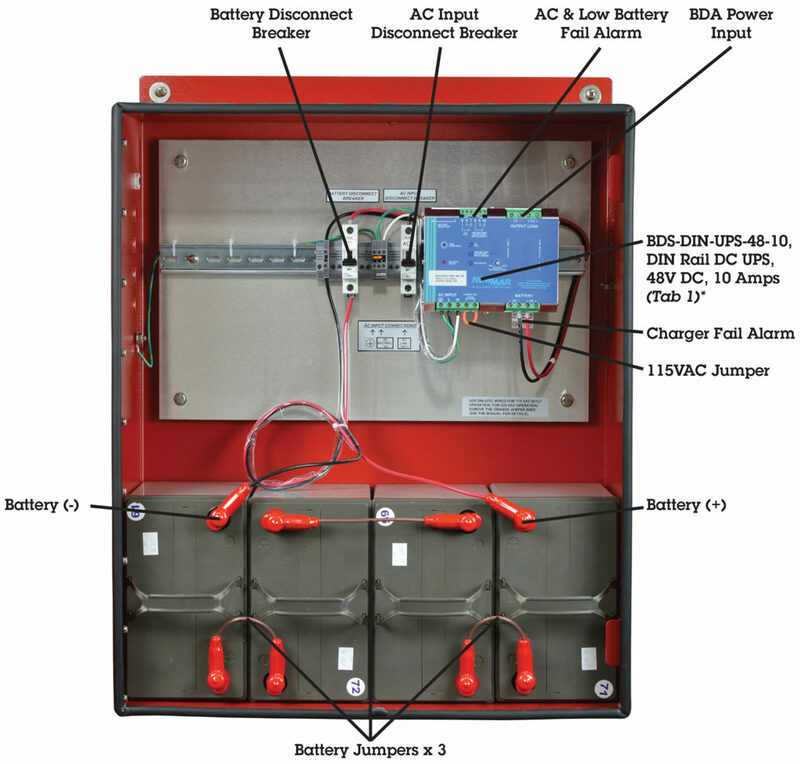 These back up power enclosures were engineered to meet every aspect of NFPA 72 and provide integrators configuration flexibility and rapid delivery directly to site, batteries included. 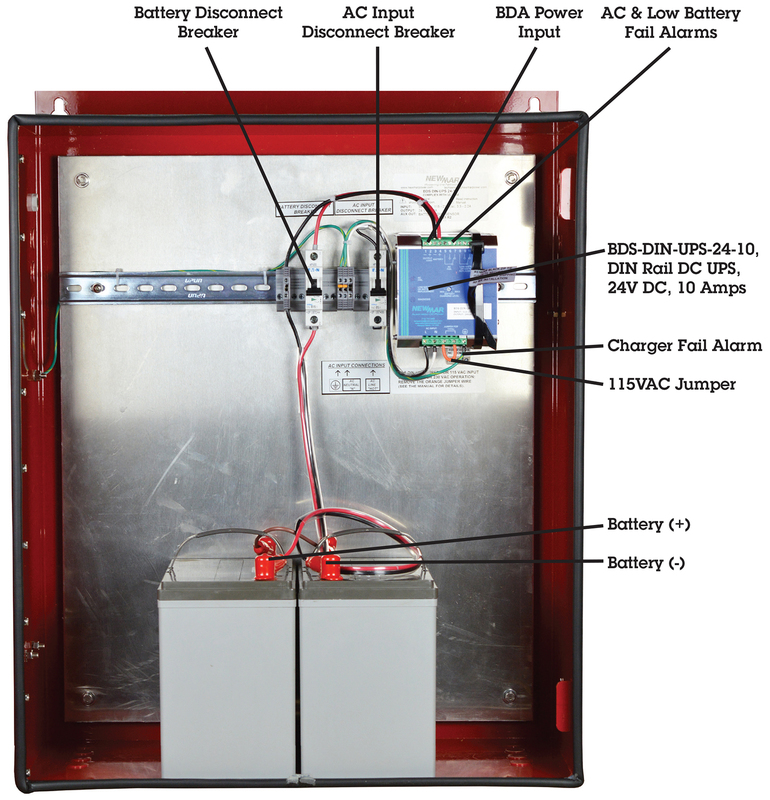 Click here for more information on the PE Series Power Enclosures that meet NFPA 1221 requirements.